This is a sponsored post from Becky’s Pet Care, a professional pet care service in Northern Virginia. 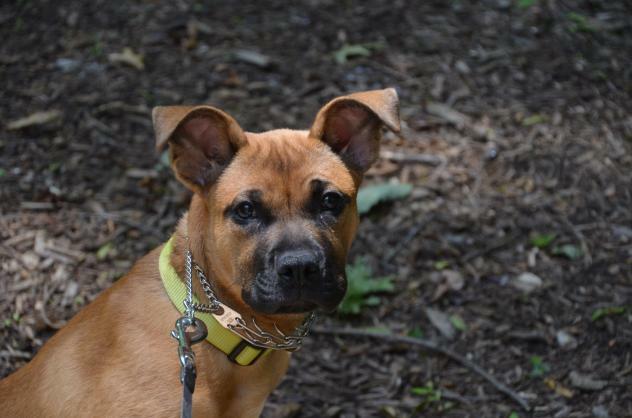 Meet Luna Petunia, a happy, fun-loving dog looking for an active home. I’m just the silly little girl that my first family called Luna Petunia. I’m happy and full of vinegar! I’m about six months old and am very, very active. I want a family to keep me busy, because a tired puppy is a very good dog. I love to run and play with my rescue mom’s Boxers. My tail is always wagging and wagging, and I am a joyful dog, but I do need training. I am crate trained, am good about taking treats nicely and my favorite dog walker says I’m very, very busy . . . seeing all the sights and sniffing all the neat things along my walk. No matter what, I won’t get into the doggie pool. That looks like fun . . . for some other dog! If you’d like to meet me, email [email protected] for an adoption application and then arrange to stop by Reston, Va., to meet me. I know, I know. I’m not a Boxer, but I needed help finding a new home, so I’m an honorary Boxer! Are you and Luna Petunia a match? If so, let us know and our sponsor, Becky’s Pet Care, will send you some treats and prizes.